Compared to conventional micro foams, a defined internal gas pressure is built up in the injection molding tool during the gas back pressure process prior to injection and injected against this gas cushion. During injection, the melt front displaces the gas from the mold, regulating the gas back pressure. A regulated reduction of the pressure takes place at the filling end. Thus, the usually occurring substantial drop in pressure during the injection and thereafter the foaming of the gas-laden polymer melt is prevented. The gas back pressure ensures a significantly improved surface quality and a weight reduction of around 8%. This results in products with a compact outer skin and a fine-pored inner core, which can be painted without any rework and further processed. 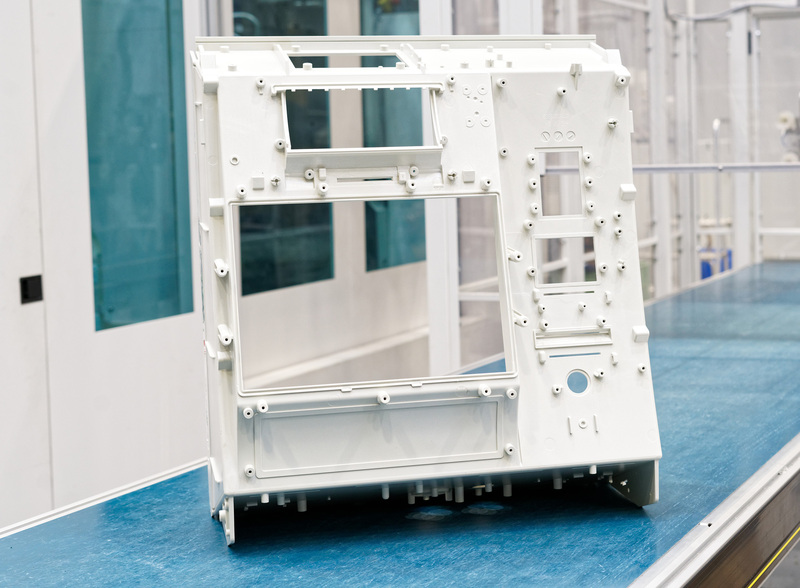 BMF uses these methods, among other things, for the front panels of ATMs up to a part weight of 6 kg.